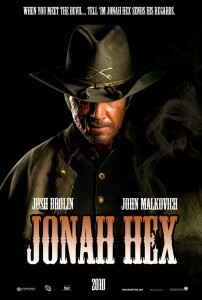 Doomed/haunted/scarred/supernatural Confederate veteran Jonah Hex (Josh Brolin) has a past, to put it mildly. In the late Civil War he “betrayed” the unprincipled Col. Quentin Turnbull (John Malkovich), who was about to burn a hospital. Hex shot Turnbull’s son Jeb, his own best friend, and aborted the hospital torching. Turnbull subsequently returned the favor by forcing Hex to watch while his own family burned alive, and his own face was branded. Kept alive by Crow Indians, the near-death experience has left him able to talk with the dead, a useful talent in his new profession as bounty hunter. As long as he maintains physical contact with a corpse, he can temporarily resurrect and communicate with the dead, bringing the corpse physically and mentally back to its condition prior to death. Hunting Turnbull, he discovers that the Colonel has died in a hotel fire. Now, more than ten years after the Civil War, Hex finds that Turnbull is still alive and planning high-tech atrocities for the 1876 centennial of U.S. independence from Britain. Hex digs up the decayed corpse of Jeb Turnbull at Gettsyburg. After a difficult interview, Jeb discloses that his father is at the improbably-named Fort Resurrection. Hex himself has a taste for out-of-the-ordinary weaponry and overcomes numerous obstacles and setbacks to foil Turnbull’s plot and defeat not only Turnbull but quasi-supernatural bad guys, with only the help of Lilah (or Tallulah, played by Megan Fox), a sympathetic whore in the Angelina Jolie-action heroine mode who looks and acts very 21st-century. Unconventional weaponry: repeating dynamite crossbows. At Fort Resurrection, Hex sees Turnbull’s new steampunk-style weapons but is badly wounded by Burke, an Irish assassin employed by Turnbull, who escapes. His Crow friends heal Hex again, and the pursuit is resumed. Hex kills Burke, but Turnbull has captured Lilah and forces Hex to surrender. As they are held prisoner on Turnbull’s weapon-ship, Lilah picks the locks on their manacles. Together, they put a fiery end to Turnbull’s plans and to Turnbull himself. The plot is something we’ve seen lots of times before, sometimes in epically bad and overblown movies (e.g., The Wild Wild West). This is pretty bad, too, if not quite epically, mixing the modern, the fictional-steampunk and the 19th-century without much consistency. This deserved a much better story, and Josh Brolin in particular is a better actor than this material allows him to demonstrate. John Malcovich can be a very good actor, but that’s not in evidence here. 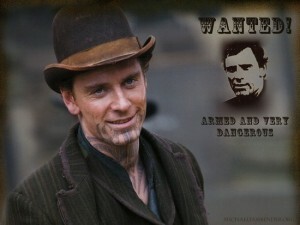 Michael Fassbender shows up before he became a big name, as the heavily (and anachronistically) tattooed Irish assassin Burke. (The tattooing seems to have been used as a substitute for actual characterization.) There was a lot of talent used badly in this film. It’s said that Brolin initially did not like the script but came to appreciate its tongue-in-cheek tone. His first instinct was right. The character and situations are intriguing enough that this could have been interesting with a better story and script. But it mostly isn’t. The music, by heavy metal band Mastodon, doesn’t help much. Michael Fassbender as the heavily-tattooed assassin Burke. This is based on a DC comic series, another bad sign. During its domestic theatrical run, Jonah Hex grossed only $10.5 million back on a $47 million budget, officially making it a box office bomb. Director Jimmy Heyward was a former animator at Pixar who worked on the first two Toy Story movies, which would seem to have little in common with this material. Relatively short, at about 80+ minutes. Often visually dark and eye-straining. 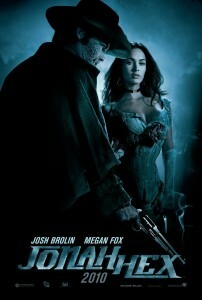 If you’re looking for a supernatural western, Cowboys & Aliens is significantly better. This entry was posted in More Westerns and tagged Bounty Hunters, Josh Brolin, Supernatural Westerns, The Mysterious Stranger on January 27, 2014 by Nicholas Chennault. “You go for a man hard enough and fast enough, he don’t have time to think about how many’s with him. He thinks about himself, and how he might get clear of that wrath that’s about to set down on him.” This line of Rooster Cogburn philosophy wasn’t explicit in the original 1969 True Grit. Many wondered if a remake was necessary, especially with westerns being so out-of-cinematic-fashion and all. But the result has been the Coen brothers’ most profitable movie to date, even taking into account their Oscar winner No Country for Old Men. The Coens’ attempt to return more closely to the original Charles Portis novel is successful on its own terms, even though much of the dialogue sounds familiar. The outlines of the story are very familiar by now: 14-year-old Mattie Ross (Hailee Steinfeld) from near Dardanelles in Yell County, Arkansas, sets out for Fort Smith in search of her father’s killer, only to find he has headed off into the wild and lawless Indian Territory to the west. She hires one-eyed Rooster Cogburn (Jeff Bridges), said to be the most ruthless of Judge Parker’s federal marshals, to pursue the killer, Tom Chaney (Josh Brolin). They are joined by a dandified Texas ranger, La Boeuf (pronounced “La Beef” and played by Matt Damon), who wants Chaney for a Texas murder. In the end, all three pursuers have demonstrated their own versions of True Grit in battling outlaws, snakes and the elements in their pursuit of Chaney and his new associates. There are various elements that are unchanged from Henry Hathaway’s original film version of the story. If anything, the remake keeps even closer to Portis’ period language and does so quite successfully. The interplay between the three protagonists will seem familiar, if more balanced with a better actor in the La Boeuf role. The high point of the movie’s action, Cogburn’s one-on-four joust with Lucky Ned Pepper’s gang in a high mountain meadow, remains one of the most compelling sequences in any western. But there are other elements that are even more rewarding in the Coen brothers’ version than they were in the Hathaway movie. The conscientious use of period details and a somber palette of colors in the production design are very thorough and work well with the dialogue. There are upgrades in several of the roles: Hailee Steinfeld in her first film role is magnificent as young Mattie Ross, in a role that could easily just be strident and irritating in the wrong hands, and Matt Damon’s performance as La Boeuf is a marked improvement on non-actor Glenn Campbell’s version of the role. Rather than being a John Wayne vehicle (the original won Wayne his only Best Actor Oscar), this version is much more an ensemble effort. The ending is truer to Portis’ novel. The music by Carter Burwell, with its theme based on a 19th-century hymn tune (“Leaning on the Everlasting Arms,” recognizable from 1955’s Night of the Hunter), feels not only authentic but haunting, and lends an elegiac tone to the entire film. The cinematography often makes use of sepia tones to suggest old photographs and natural 19th-century lighting in the wintry setting. Cogburn (Jeff Bridges) and La Boeuf (Matt Damon) confer on the trail. If anything, making this movie might be harder now than it was in 1969. The Coen brothers suggest that one reason is that rules for filmmaking with horses have become much more stringent in the intervening 40 years. The Coens could throw their 14-year-old lead actress into a freezing river with impunity, but the water had to be at least a certain minimum temperature to do the same with a horse. Among the less persuasive sequences are Rooster and Mattie’s desperate ride for medical help on the floundering Little Blackie. One reason it’s less effective might be the inability to actually put such stress on an animal, and relying more on sound effects (such as the heavy equine breathing) and editing. The rhythms of the motions of the two riders on the horse don’t seem right in the closeups, and that may be because they weren’t actually on a horse for those shots. Nevertheless, the Old Testament flavor, from the initial scriptural “The wicked flee when no man pursueth…” (Proverbs 28:1), to the narrating Mattie Ross’s comment that a price must be paid for everything in this world save the grace of God, to the older Mattie’s thoughts on Rooster’s final resting place works very well. It gives both the younger and older Mattie a hard and unforgiving edge (not in precisely the same way), which serves her and Rooster well in the hard and unforgiving territory where they must navigate and with the hard and unforgiving men with whom they must deal. In the end we see not only True Grit on display with the three principals, but the honest affection and regard in which they come to hold each other and the way they have re-shaped the course of each other’s lives, especially young Mattie’s. And there is a slight sadness for the ways in which the course of one’s life turns out to be other than one might have wished. Rooster Cogburn as played by the excellent Jeff Bridges (with the eye patch on the opposite eye from John Wayne) is more enigmatic, just as coarse, harder and, when the chips are down, just as capable and decisive as the earlier Cogburn. Although Bridges didn’t win an Oscar for this role, he was nominated. The supporting roles are well-played, especially Dakin Mathews as the horse trader Col. Stonehill in Fort Smith and Barry Pepper (scarcely recognizable in his woolly chaps, stringy hair and dental prosthetics) as Lucky Ned Pepper, head of the gang with which Chaney falls in. They play roles that were superbly played in the original by Strother Martin and Robert Duvall, and they hold their own. Josh Brolin has little screen time as Tom Chaney and he seems a bit overly charismatic for someone who is after all just a stupid killer; but he is otherwise excellent in the role. This version of True Grit was a surprise success at the box office. The first $100 million western since the 1990s; it eventually passed Dances With Wolves to become the highest-grossing western ever made. 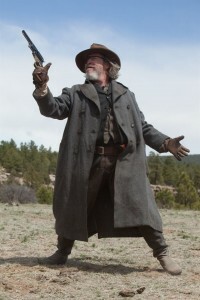 It received ten Academy Award nominations, including Best Picture (although the field for that award had been doubled to ten films beginning the previous year), Best Director for the Coen brothers, Best Actor for Jeff Bridges (even though he’d won for Crazy Heart the previous year and John Wayne had won for the same role 40 years earlier, so chances of Bridges actually winning were minimal), and Best Supporting Actress for Hailee Steinfeld. It was also nominated for Adapted Screenplay, Art Direction, and Roger Deakins’ Cinematography. It didn’t win any of them, defeated mostly by The King’s Speech. 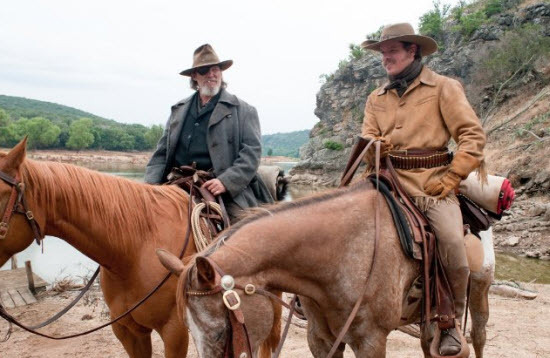 This entry was posted in 55 Greatest Westerns and tagged Jeff Bridges, Josh Brolin, Manhunts, Outlaw Gangs on July 23, 2013 by Nicholas Chennault.